Kids’ request: Stuffed bell peppers? They asked for it. Both of them. 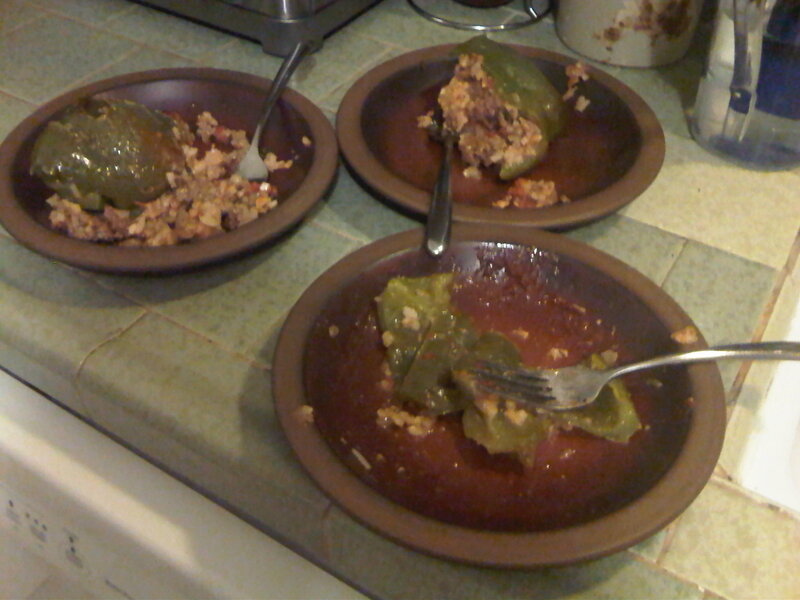 And so Friday night I made them stuffed bell peppers. Who was I to say no to a specific request made by both nits? Hardly fancy. Stuffed bell peppers fall into the category, in my mind anyway, of ’50s-style food. Casseroles, beef Stroganoff and the like. The kind of thing foodies don’t bother with anymore. But nobody’s really a foodie at my house, and since I’m still learning my basics, I felt an obligation to do my best to give them what they wanted — in all its basic basic-ness. And at any rate, I was thrilled they requested real food instead of breakfast cereal or Top Ramen, or, say, bread. The recipe comes from the Cook’s Illustrated New Best Recipes tome, the most basic, hand-holding sort of cookbook you can find, and thank God for that. Because this old standby is something I could really do terrible things to if not explicitly instructed. And even then, I’m lucky these turned out as well as they did. I had to substitute a few ingredients, nothing major, but you know what happens when I start substituting. The recipe calls for blanching the peppers, tops cut off and de-seeded, of course, in boiling water for three minutes and then left on the counter to cool. Cool cut side up so the steam from the water doesn’t get trapped in the pepper and make it soggy. After you’ve blanced the peppers, remove them with tongs and throw the rice into this water to cook, about 13 minutes. Drain, set aside. Meanwhile, saute your onion, then throw in the beef and brown for about 4 minutes, using your spoon to cut it up into small pieces. Once it’s no longer pink, throw in the garlic and sauted until just fragrant, about 30 seconds. Drain if you need to, then transfer all this to a bowl and mix in the rice and the tomatos, one cup of the cheese, parsley, and salt and pepper to taste. Stir the ketchup and 1/4 cup of tomato juice into a little bowl. Place the peppers cut-side up in a 9-inch square baking dish and fill each one with the stuffing. Spoon two tablespoons of the ketchup mixture over the top and sprinkle the remaining 1/4 cup cheese over this. Bake until the cheese is browned the the filling heated through, about 25-30 minutes. Serve immediately with crusty bread. Milk for the kids, big glass of wine for Mommy. In the end, nearly faint with hunger, I fell on mine, while the kids ate exactly half of theirs. I have one left over that I plan on fobbing off on their Dad. He’ll eat most anything. Not that these peppers were bad at all — what’s not to like about ground meat, rice, cheese and green peppers? I couldn’t help but think it could be even better, though. More flavorful, somehow. I think I might have altered the essence of the thing with all my substitutes. Maybe I’ll search the Internets for a different recipe? In the meantime, practice makes perfect. My new mantra. Red and yellow bell peppers have a much milder flavor and are slightly sweeter. Good for those of us that have repeat issues with the green ones.